“If tomorrow your capitals face danger from terrorism or Zionism, the power that will give you a positive answer is the Islamic Republic of Iran,” Rouhani said, according to the Associated Press. Rouhani reportedly delivered the comments in front of a mausoleum dedicated to the the founder of Iran’s revolution, the late Ayatollah Khomeini. 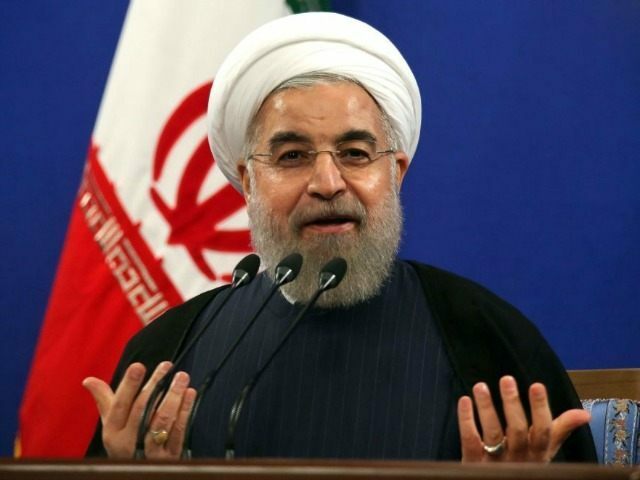 Rouhani reportedly added that Iran would only help the other nations if Muslim countries requested its aid and insisted that the surrounding Gulf Arab states should not feel threatened, alleging that Iran’s military power would be used for defensive and deterrent purposes. The Islamic Republic seeks a growing hegemony in the region and is at stark odds with Saudi Arabia, as the two nations are backing opposing sides in the ongoing Syrian and Yemeni civil wars. “The power of our armed forces is not against our southern, northern, eastern and western neighbors,” Rouhani reportedly said. On display Sunday were tanks, light submarines, short-range missiles, and other weapons, including a Russian-made S-300 surface-to-air missile that was delivered to Iran earlier this month. Last week, Iranian Maj. Gen. Qassem Soleimani reportedly flew to Moscow, which is considered in defiance of international law stemming from an international travel ban, to discuss Syria and the delivery of Russian missiles to the region. Reuters broke the story, reporting that one of the purposes of his visit there was to discuss new delivery routes for shipments of the Russian S-300 air defense missiles. Soleimani also reportedly discussed Iran’s role in helping the Russia-backed Bashar al-Assad regime in Syria take back the city of Aleppo. Both the Kremlin and the Iranian embassy in Moscow denied this, however, and said a meeting between Soleimani and Putin was not on their schedule. According to Iran’s Tasnim News Agency, Iranian Parliament Speaker Ali Larijani will travel to Russia this week, between April 18-20, to attend a meeting of parliament speakers of the Eurasian states. The announcement was reportedly made by Iran’s ambassador to Moscow. Rouhani’s comments on Sunday arrived just days after the close of the 13th Organization of Islamic Cooperation (OIC) which took place in Istanbul. There, Iran and their biggest rival in the Middle East, Saudi Arabia, reportedly went head-to-head with both nations sparring over the inclusion of verbiage which was critical of the Islamic Republic and reportedly denounced Tehran’s role in the Arab world. Faghihi noted Iran’s ultra-conservative newspaper Vatane Emrooz had published an article stating that Saudi hostility towards Iran is no surprise and even questioned why President Rouhani had decided to attend the conference to begin with.